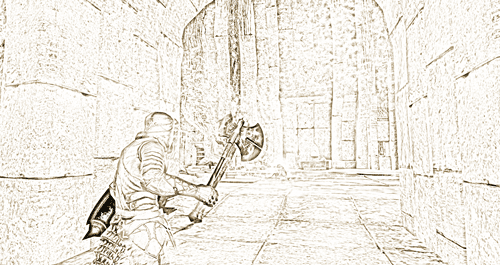 I had been travelling nearly two days from Greenshade on my way to Silvenar, the principal settlement in Malabal Tor. A loud commotion at a nearby Ayleid ruin caught my curiosity. A Khajiit Merchant had a half dozen displeased customers demanding a refund and a pound of his flesh. Using some diplomacy skills, I defused the situation and in return he agreed to open the warded entrance to the nearby Belarata Ruins. A tale of star-crossed lovers torn apart by war, separated by death. In front of the barrier, you will find three scraps of parchment. They will appear in your quest section of your inventory once you read them and you call read them later from there. When you complete this quest, you will also get a skill point. Note: on your way out, the three scrolls and a two new lore items will appear. The text on the sword and a fourth scrap will appear.